PlayThunder Offers presents a funky combination. It allows playing online games, but it is also an advertising tool, and while many online game providers show ads, not all of them reveal the service as straightforwardly. In fact, the add-on is primarily promoted as an advertising tool. At the moment, it is compatible with Google Chrome only, and users can download it from the Chrome web store at chrome.google.com/webstore/detail/playthunder-offers/emkkigmmpfbjmikfadmfeebomholoikg. If this is not where you found it, you might have downloaded it using a third-party installer along with other questionable extensions or apps. If that is the case, you might be at a bigger risk, but our research team recommends removing PlayThunder Offers regardless of how it was downloaded. At the end of the day, this extension is adware (advertising-supported software), and it is unlikely to serve you in any beneficial way. If you want to learn more, continue reading, and if you wish to delete the extension as soon as possible, check out the full instructions below. 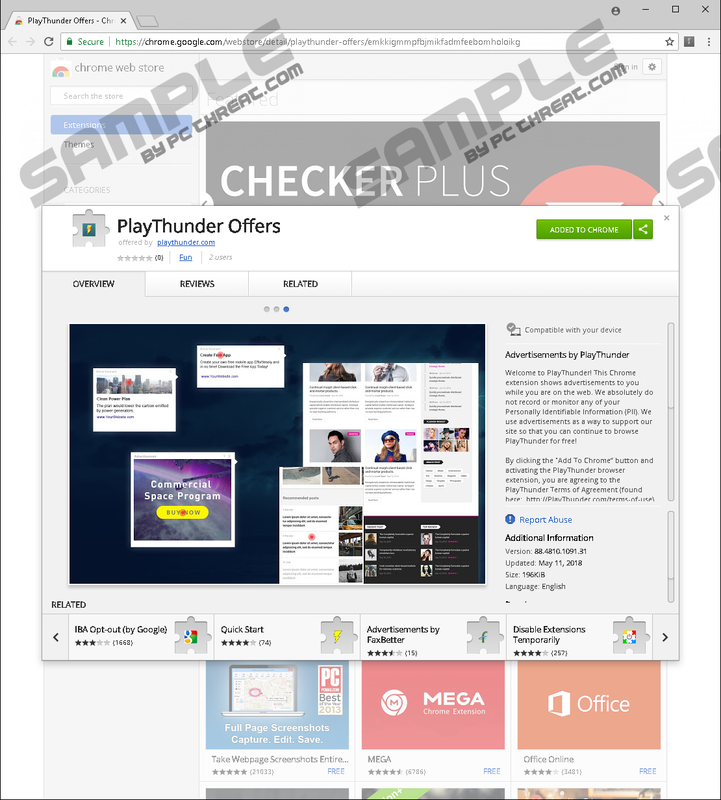 The website that is represented via the Chrome web store installer page is playthunder.com. If you live in the European Union, you will not be able to access the site because of the GDPR (General Data Protection Regulation) Law that was implemented in May 2018. Clearly, the website does not comply with the regulation, and that says something. Can you trust a service that does not follow the law or safe data-protection practices? Regardless of that, anyone can download the extension. According to the official promotion, if the user downloads it, they are shown advertisements regardless of the website they visit. Although it is suggested that personally identifiable information is not recorded or monitored, you need to think about other things. For example, if PlayThunder Offers records your geographical location, your browsing history, or the way you interact with ads, they could help unknown advertisers introduce you to personalized advertisements. Well, what’s so bad about that? If ads are personalized, they are more beneficial, right? That truly depends on how you look at things. According to our research team, if you do not delete PlayThunder Offers, you could potentially face falsely attractive offers too. What do you know about online advertisements? You probably have seen annoying, flashing ads that offer magical treatments or too-good-to-be-true offers. These are clearly bogus, and you should never interact with them. Unfortunately, misleading ads could be more clandestine as well. For example, if you have searched for a cheap laptop, a banner advertisement promoting one could pop-up soon enough. It might promote a questionable online vendor, or it could route to a website that has nothing to do with laptops at all. Then there’s fake surveys, prize giveaways, and online forms. By filling those out, you could be putting personal data at risk. You also have to be very cautious about attention-calling pop-ups and banners that might be urging to scan the computer, remove allegedly existing malware, or contact “technicians.” Overall, PlayThunder Offers might be completely unreliable, and since the ads delivered by this extension are created by unfamiliar parties, you really want to consider all of the risks carefully. Do you enjoy playing games online? If you do, you might be installing extensions and applications that offer to make the experience better in one way or another. We recommend that you install only those extensions and apps that are truly beneficial and reliable, as you do not want to sacrifice your virtual security. PlayThunder Offers might allow playing games, but its primary purpose is to showcase advertisements, and it has partnered up with unknown advertisers for that. Can you trust them? We cannot know for sure, but you certainly need to think about the virtual security risks you could face if you interacted with all ads carelessly. Remember that pop-ups, interstitial ads, and banners are always used to sell something, and the products or services offered are not always legitimate. Make sure you stay away from surveys, strange online forms, ads promoting installers, fake alerts, and fictitious offers. Better yet, delete PlayThunder Offers altogether. To do that manually, follow the instructions below. If this adware came in bundled with malware or unwanted programs, consider using an anti-malware tool that could erase them all automatically. Simultaneously tap keys Alt+F to open the menu on the right. Click More tools for additional options to show and then click Extensions. Click the Remove button linked to the unwanted extension. Quick & tested solution for PlayThunder Offers removal.